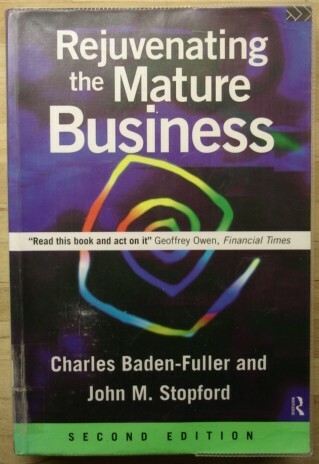 2nd Edition first published in 1996 in Great Britain by Routledge in pbk, 282pp, ISBN 0415135206. About the book: This book provides a landmark approach to corporate strategy. In this challenging, newly updated study, the authors call into question many of the leading theories in strategic management. Instead of emphasizing the decline of industries or economic sectors when explaining business success or failure. Instead the book places the individual enterprise itself at centre stage and show how particular businesses and management teams can achieve spectacular turn-around even in the most hostile environments. The key message is that organisations can rejuvenate and seek industry leadership when they reject standard industry 'recipes' and set out to innovate not just new produces and new processes, but also, most importantly, new strategies. What has been achieved by innovative managers who avoid the trap of conventional thinking is illustrated by many examples drawn from a wide range of international businesses. The authors show how progress is possible with limited resources. Achieving the elusive goal of sustainable competitiveness requires building step by step, an entrepreneurial organization that captures and gains leverage from the values of experimentation, imagination and skill enhancement at all levels. About this book/synopsis: The book contains the ideas from over 30 of today's most innovative CEOs; ideas that are rejuvenating and reinvigorating the modern corporation. This book is a major event because the world rarely hears directly from the great contemporary business leaders - the chief movers and shakers of major corporations. Working closely with the Price Waterhouse management team, a wide variety of chief executives who are successfully managing today's rapid pace of economic change present their ideas about leading and motivating people, unleashing their innovation and creativity, and learning from customers to revitalize their businesses. Introduction: CEOs Demand the ABCs - Awareness, Belief and Conduct by G. William Dauphinais and Colin Price. 1. Flemming Lindelov, Carlsberg Group: The Best International Brands are "Glocal"
Part 4. Culture: Fifteen Glorious Years! Part 6. Customer Relationship: The Brand is Dead. Long live the Brand!